Unfortunately, the dress you are looking for (Style: DQ-9660, Name: DQ-9660) is no longer available. Make a beautiful impression in this long mother-of-the-bride or groom dress when only the best will do. 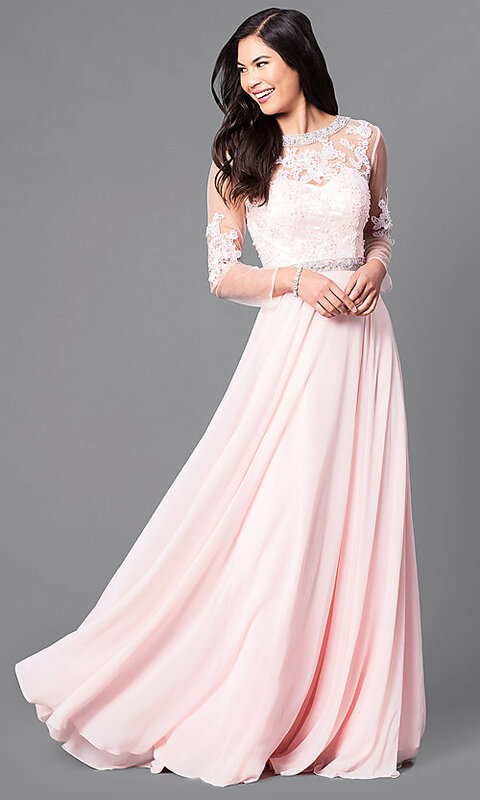 This beautiful long formal dress has delicate lace applique that adorns the long-sleeve illusion bodice with sweetheart lining. Diminishing the need for jewelry, the lovely evening dress has shimmering jeweled bands at the bateau neckline that attach in back above sheer panels that beautifully frame the triangular-shaped cut-out detail. A matching beaded band adorns the natural waistline of the softly flowing long a-line skirt that floats away from the hips in layers of silky chiffon. Available in misses and plus sizes, this long mother-of-the-bride or groom dress under $200 will flatter the figure while remaining budget-friendly. The model wearing blush is 5'7" and wearing 4.5" heels.